There was a bright glow in my bedroom when I opened my eyes this morning. That light and the particularly cold nip in the air told me before I even looked out the window that it had snowed during the night. At left you can see the snapshot I took from my upstairs window. Snow covered the tiled roof of my house and dusted the camelia trees of the temple across the street. 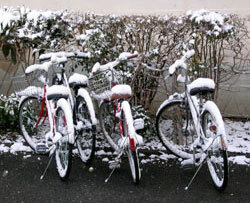 We don’t get a lot of snow in Kyoto — a fact for which, my little California soul is quite grateful. 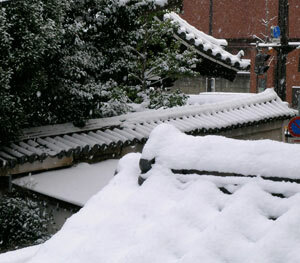 But the lovely gracefulness of Kyoto sites become all the more glorious with a gentle touch of winter white. 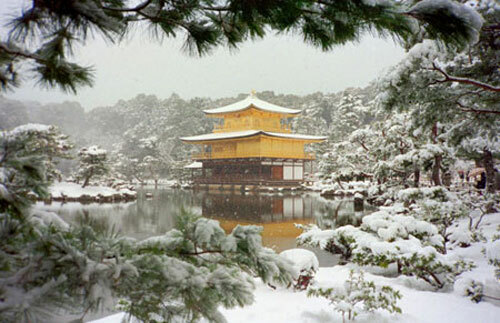 Below is a picture of Kinkakuji, the famed Golden Pavilion of Kyoto. On a normal day, its just a 15 to 20 minute bike ride from my house. Of course, snow makes that ride just a little bit more challenging. So maybe it’s just a very, very good day to stay inside with my sewing machine. This entry was posted in Kyoto living on February 24, 2008 by admin. For over a thousand years, Kyoto has been the textile capital of Japan and my house in Kyoto is on the edge of Nishijin, the silk weaving district of old Kyoto. Although the number of weaving families has diminished, there are still places where I can still hear the thumping of the heddles and slap, slap of the weaving shuttle sliding back and forth across the loom as I bike around the narrow back streets of my neighborhood. The Nishijin style of weaving uses yarn dyeing, in which yarns of various colors are woven into intricate patterns. 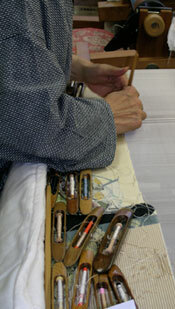 This technique is both time-consuming and labor intensive compared to other styles of weaving, but it is indispensable for creating the elaborate designs required for kimono fabric. Despite considerable evolution of kimono styles throughout the ages, Nishijin has remained a major production center for high quality textiles. Silk cultivation is thought to have spread from China through Korea and finally down to Japan during the Yamato period about 1500 to 1800 years ago. The earliest kimono developed at that time but were generally a plain woven white, since silk dyeing techniques were not developed until the later Nara period. By the Heian era when the Japanese capital was moved from Nara to Kyoto around 1200 years ago, silk weaving had evolved to a highly complex art catering to the tastes of a sophisticated aristocracy. The most intricate of Heian era kimono could have as many as twenty layers of fabric. 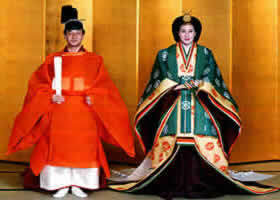 Although this type of kimono, called a “juni-hito” or twelve-layer, has disappeared from common use, it is still used for the most ultra-formal of ceremonies such as the wedding of Masako-sama to Crown Prince Naruhito in 1993. As kimono styles simplified, the range of fabrics increased. Major development in textiles came in the 16th century, when Japan saw imports of new patterned silks, damasks (donsu), figured satins, woven silk stripes (kanto), rich, heavy brocades interwoven with gold or silver leaf laminated onto washi then cut into thread-like slivers(kinran and ginran), new patterned silk gauzes (ro and sha) and light silk crepe (chirimen) from China and cotton calico (sarasa) from India. By the end of the 16th century, Japanese weavers began to imitate these styles, producing their own distinct variations. The range of these weaves in combination with a variety of surface design techniques ranging from brush-dyeing to intricate embroideries has made Japanese textiles among the most treasured fabrics in the world. This entry was posted in Japanese fabrics, kimono, Kyoto living on February 9, 2008 by admin. Here in Japan, the lunar new year is preceded by setsubun, a minor holiday marking the division of seasons and announcing the start of the lunar year. But unlike the major celebrations currently on-going in China and other parts of mainland Asia, the Japanese setsubun is a relatively simple holiday filled with bean-throwing, maki-sushi eating and a wee bit of merry-making. “Bean-throwing?” you might ask. 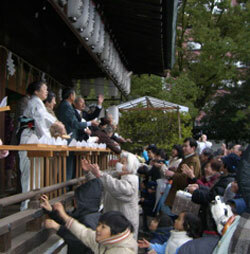 Yes, the tradition on this day is to stand in front of your doorway and thow handfuls of dried soybeans towards the northeast while chanting: “Oni wa Soto; Fuku wa Uchi”, which is generally translated “Demons get out; Good luck come in.” Then family members each eat a serving of beans equivalent to their age plus one for good luck. That is, a 5-year-old should eat 6 beans and a 60-year-old should eat 61. Children, of course, make more of a game of it — dressing in oni masks and pelting each other with candied beans. Though devilish in appearance, oni seem to be more like mischievous poltergeists. Local Shinto shrines also participate in ritual bean-throwing. This picture was taken at Shiramine shrine, where shrine maidens, celebrities and politicians tossed beans from the walkway surrounding the main shrine. The tradition was apparently imported from China about 750~800 years ago, but originally rice was thrown as an act of purification. Later soy beans were used, since beans were thought to be better able to blind any malevalent attacking spirit, driving it away. Other protective traditions include placing a holly leaf and a dried sardine head on the gate post outside one’s home, as the sharp prickly spines of the leaf and the dried fish odor are also thought to drive away oni. So now that 2008 is well and truly here and all the new year’s parties are over, I guess there’s nothing left to do but get on with the year and see what kind of luck 2008 will actually bring. This entry was posted in holidays, Kyoto living on February 5, 2008 by admin.